Continuing in the key of E minor we will now play the fifth position or mode of the E minor pentatonic scale. The fifth note in the scale of E minor pentatonic is D, so we will begin this fifth mode on the D at the 6th string, 10th fret. Notice how it directly ties to the fourth position we played earlier. All the notes on the right of the fourth’s position pattern are the same as the notes on the left of the fifth’s positon pattern. Remember to learn these in order, so if you landed on this page first after searching the web, go up to the menu and find the first mode and begin there. 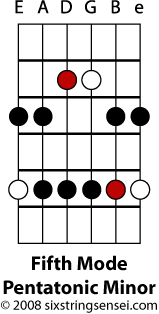 Also note how this pattern is identical to the fourth mode of the pentatonic major but the root (white) and fifth (red) notes appear in different places.